The Centre for Planetary Science and Exploration commenced a 3-week long “analogue mission” called CanMars on Monday October 31, simulating a future Mars Sample Return mission. This is carried out in partnership with the Canadian Space Agency, and features a rover and field team down in Utah and a mission control team here at Western in the Physics and Astronomy Building. 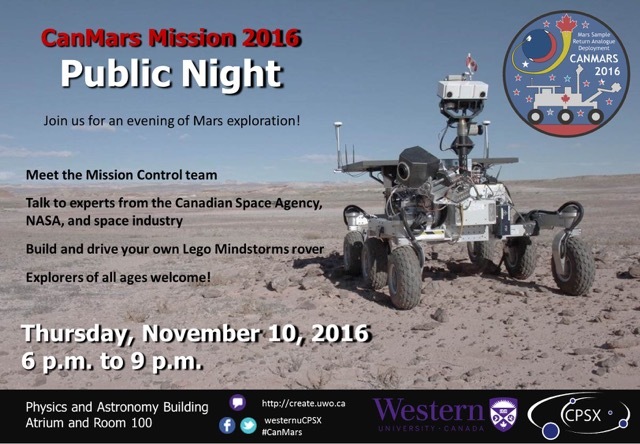 We will be hosting a Public Night on Thursday Nov. 10th from 6:00 PM to 9:00 PM at Western University's Physics and Astronomy Building Atrium. This is an exciting opportunity for you to learn about the analogue mission as well as interact with team members, government and industry partners involved in the analogue mission.We will have representatives from the Canadian Space Agency, NASA and MDA in attendance. The event will also inlcude hands-on activity of building and driving your own Lego Mindstorms rover. It is a family friendly event.